Angela is a Warnindilyakwa woman from Groote Eylandt in the Northern Territory. Groote Eylandt archipelago is located on the western side of the Gulf of Carpentaria, approximately 600km south east of Darwin. The traditional owners are Warnindilyakwa, but are referred to by their language name Anindilyakwa. There are three Indigenous communities in the archipelago – Angurugu, Umbakumba and Milyakburra (Bickerton Island). 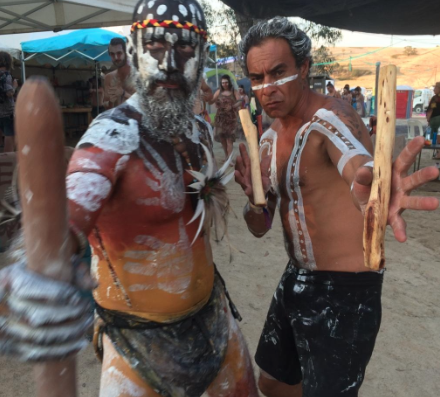 Growing up on the Eylandt, music and dance is an integral part of daily life. Ceremony and special occasions dance was always central to proceedings. 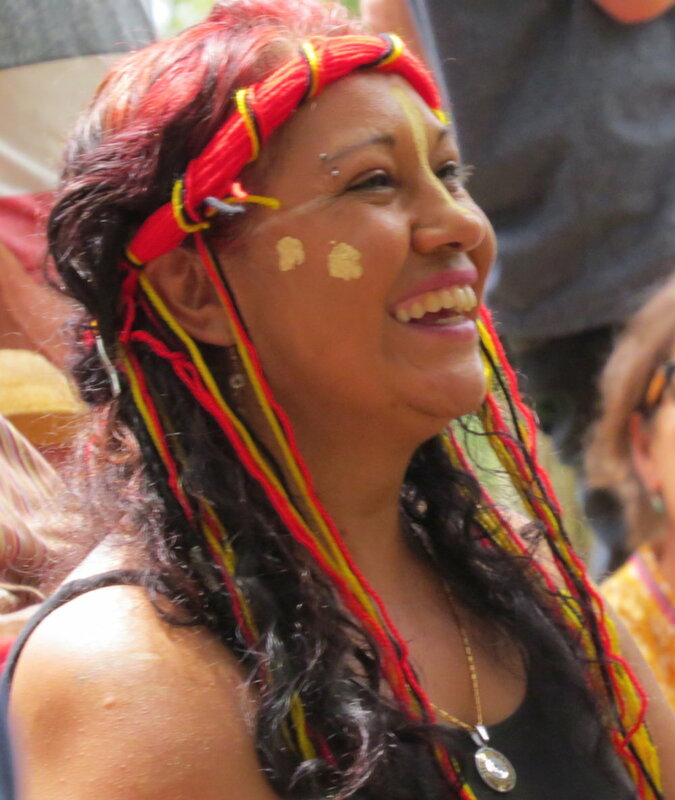 Angela is a custodian for her tribe, the Wurramara tribe from Milyakbura (Bickerton Island) and as such has been entrusted by the elders to hold, teach and share the dance of this community. Angela has enhanced her own passion and skills for culturally-influenced contemporary dance by studying at the Aboriginal Centre for Performing Arts. After graduating Angela returned to her community to work with young people to develop skills in both contemporary and traditional dance, as a means of addressing youth suicide and crime. Angela has developed a number of unique pieces of dance and story-telling work and would like to work with Jade to further develop her concepts for public presentation. Provoked by her mystical Javanese heritage, Austronesian cultural insights and lifelong connections with indigenous communities, Jade’s captivating work crafts body, space, sound and image to evoke stories of transformation with seen and unseen forces. Worldwide dance studies in ballet, modern, improvisation and cultural forms has ushered an expansive 20 year freelance career with many diverse theatre companies and unique contemporary artists. Inspired by travel, architecture, film, music, choreographic and somatic practices she returned to Australia in 2005 to gain a Master of Choreography (High Distinction) at Victorian College of the Arts. Her interdisciplinary intercultural performance work is supported by government and philanthropic funding, and has won awards at Fringe Festivals and been shortlisted for Green Room and Australian Dance Awards. Kirk’s descendants are from the Mulandjali people in south-east Queensland, Badu Island in the Torres Strait, Germany and Wales. He is the Associate Artistic Director at the Northern Rivers Performing Arts (NORPA) Company, Lismore NSW. 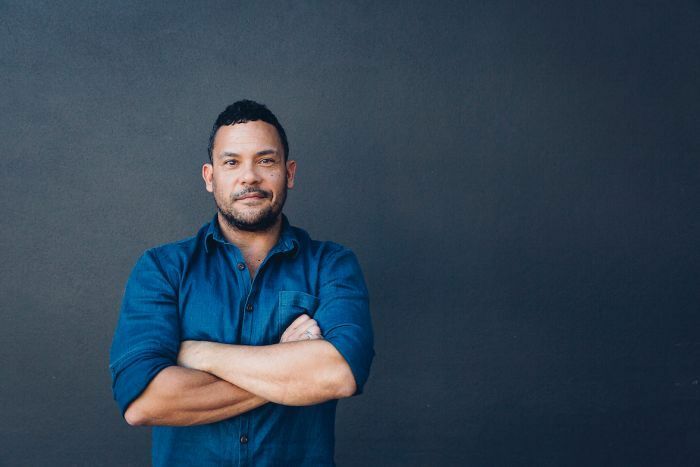 Kirk has worked in film, television and theatre as movement consultant and director on ABC’s My Place, Bran Nue Dae, Krush Legs on the Wall, Melbourne Commonwealth Games Opening Ceremony and Bangarra Dance Theatre – Rekindling Youth Dance Program, to connect Aboriginal teenagers with their culture and awaken their artistic and performance skills. Merrigimpba Nunukul, Minjerribah is my traditional name meaning the sea eagle. I like to use song and dance, or kunjeil, as a medium for creating paintings through the story of the songlines from the Quandamooka region. Connecting back to Country and Nature with its seasonal changes is my main thematic force in works I complete in sculpture and painting. These themes guide my artworks, music and educational activities and stem from my cultural background as a descendant of the Jandiwal Nation. There is a great hunger for the cultural experiences that I am blessed to share, and workshops in the community and schools have been very successful and are a great way to share such knowledge through song and dance. Shae Duncan is a Kamilaroi woman from Moree and now based on the Central Coast of NSW. She is a graduate of NAISDA Dance College with a Diploma in Professional Dance Performance. Whilst studying, Shae has been on cultural residencies where she explored traditional dance and has performed at such festivals as Message Sticks, Garma, Yabun and Festival of the Brolga. Shae has toured an interactive kids show “Datlwuy Dreaming”, collaborating with MusicaViva and cultural tutors from North East Arnhem Land to offer cultural awareness to schools. For over 5 years, she has been working with Beyond Empathy as a performer, teacher and choreographer. Shae has a desire to be a role model on behalf of her community for both indigenous and non-indigenous young people. Jaymen Drahm is a Yidinji, Mamu man from Innisfail, Queensland. He is an accomplished contemporary and Hip Hop dancer with 10 years experience and has led community dance workshops in various projects for Beyond Empathy over the last 4 years including Festival of the Brave in Armidale. In the last two years Jaymen’s contemporary style has fused with traditional dance from his Yidinji, Mamu culture, resulting in an exciting hybrid interpretation. Ria is a vocalist, musician, composer and teacher. Born in Melbourne of Australian / Indonesian descent, she draws on her deep respect for the Javanese musical tradition in her original compositions and soundscapes. Her distinct, haunting vocal style also reflects an eclectic range of genre influences, and she has recorded with a diverse range of ensembles – across genres – including contemporary and trad-world, to jazz and improvisation.